$1125.00 includes entire Mai Chau experience. Some of the highlights of the trip. Bicycling through the beautiful rice paddy fields, scootering through the rural countryside, taking time out to interact with amazing locals along the way. We have lots of areas to explore that you never would of found on your own. We like to keep our groups small. So don't hesitate to sign up. This will be a once in a life time experience. Spots fill up fast. You will spend 7 days in the friendly country of Vietnam. This off the grid adventure will be the trip of a lifetime for anyone who wants to have spiritual growth filled with beauty and adventure. You will get to experience culture along with making a difference to humans and animals. The LTL experience. Your journey begins in Hanoi, you will meet your hosts in the bustling area known as Old Quarter, you will spend one night in a quaint hotel that includes breakfast and air conditioning. In the morning you will get to meet all your new friends who you will be getting to experience this journey with. We will take a 4 hour car ride into the mountains of northern Vietnam. Don't worry there will be a bathroom break in the middle of the drive. The group will be staying in a homestay we have been staying at for years. You will arrive in Mai Chau just in time for your first of many home cooked Vietnamese meals. Picky eaters, be at ease there are many options to choose from veggies, to rice and choices of meats. Sometimes we might surprise the group with excursions to stay at other nearby villages for a night or two. 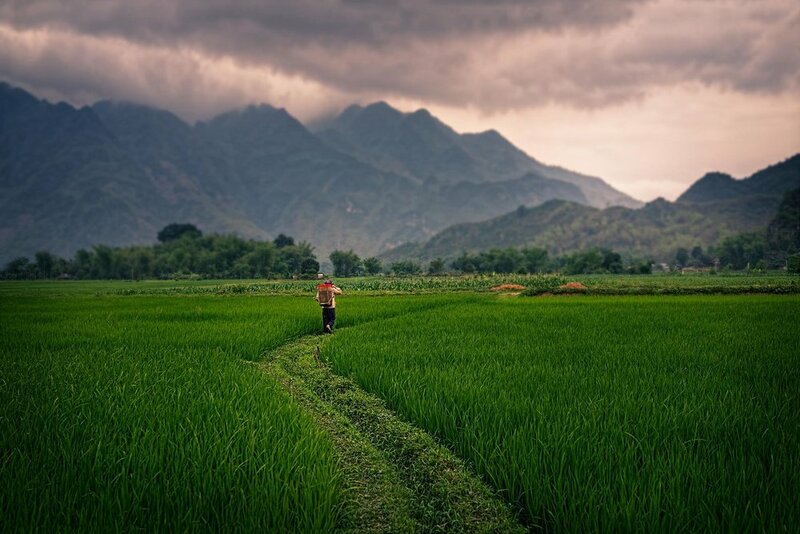 While you are in the gorgeous green amazingness of Mai Chau you will get 3 meals in the home we are staying at, We will wake, have breakfast and head off to give back to the locals in the morning. In the afternoon we will come back home for a delicious lunch, after lunch we will have the opportunity for exploring, adventures and free time. After a few days in the home stay we will move onto a unique location with beautiful views, each trip is customized to each group, locations will change per availability and group interests. We like to surprise our groups. This trip is a photographers dream If you ever wanted to capture images of the beautiful countryside of Vietnam and all the beautiful faces this country has to offer then this is the trip for you. Jim Kennedy a professional photographer and one of the founders of love the Locals makes sure you will have many amazing photo opportunities. See some of his travel images here. More about Giving Back, Jim and his local partner Quy who lives in Vietnam locate an opportunity to make a difference in a local village, a plan is set up before our arrival as jim says, we do the grunt work. On some trips we do multiple projects. Throughout the trip we try and find other individuals in need, there are many in this area. We encourage our guests to bring donations. We bring children's toys and clothing, along with some adult clothing (sizes small). It is also fun to have items on you while you are out to give to kids like small toys or candy. A good portion of your fee for this trip goes back into the communities that we will be visiting. We get so much out of these trips we want to make sure the locals of the area know we want to give back and make a positive impact on their communities. We are always happy to set up a phone call to talk more about our experiences and answer any of your questions. These trips are always small groups so we are able to give you lots of personal attention.